There are science fairs, art fairs, National History Day fairs... why not English fairs? Maybe it's time to add a special school-wide event promoting literacy, artistry, and imagination at your school. What am I talking about? A one-pagers fair! 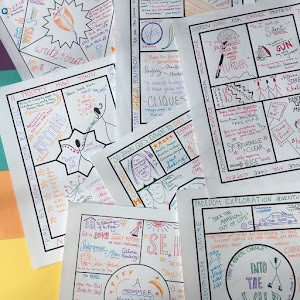 Since I first blogged about the concept of using templates to help students explore literature with one-pagers over a year ago, thousands of teachers have introduced this project in class. I love seeing the amazing results all over social media and in my inbox too. What creative work our student are doing! Let's go on a quick tour of a few examples over on Instagram.. When I see the quality of work students are producing, I love to imagine them getting to share that work with their entire school and community. 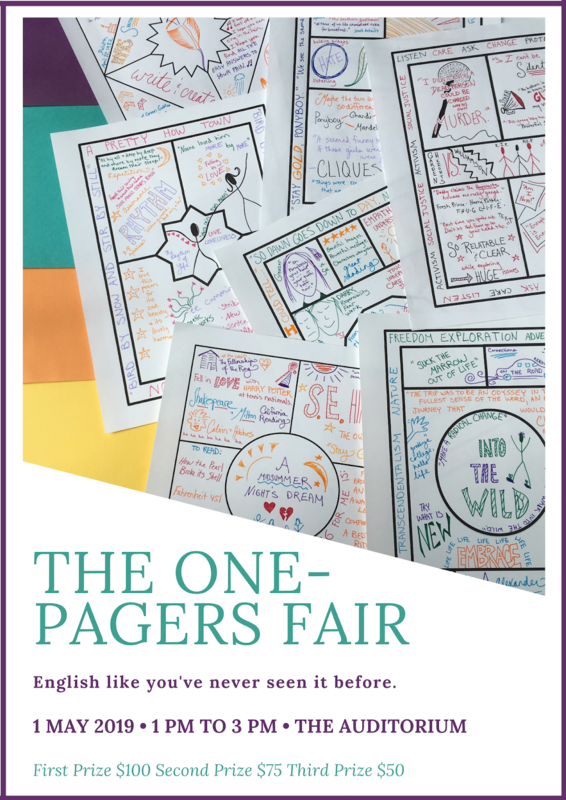 By the way, before we dive into the fair, if you haven't yet signed up for the free one-pagers assignment including four types of templates with four different sets of instructions to choose from, you can sign up for those below. All the photos above feature the templates from this free download. So what would a one-pagers fair look like? Well, there are a lot of ways you could do it. 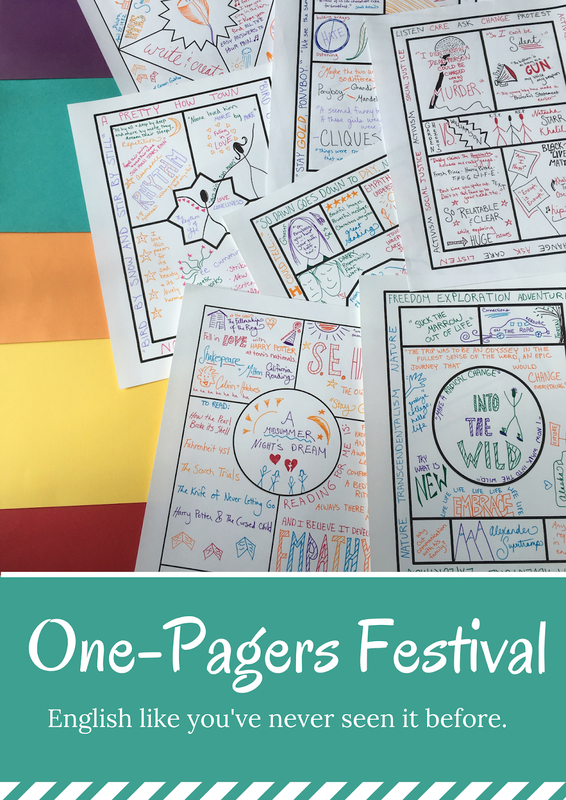 You could have every English student at your school create a one-pager for the novel of their choice, whether an in-class read or an independent reading book. You could let every English teacher choose a different type of one-pager to do with their students, whether on novels, poetry, nonfiction, essays, short stories, podcasts, or films. The one-pager fair would be a celebration of so many different forms of 21st century literacy. You could share the idea with your whole English department, and just let those who are interested have their students participate, leading perhaps to a smaller fair. You could pilot the fair with one grade level or course - having all 9th graders share their independent reading or literature circles books through one-pagers, for example, or all A.P. students produce one-pagers connecting multiple works as a term-ending assignment leading into the fair. 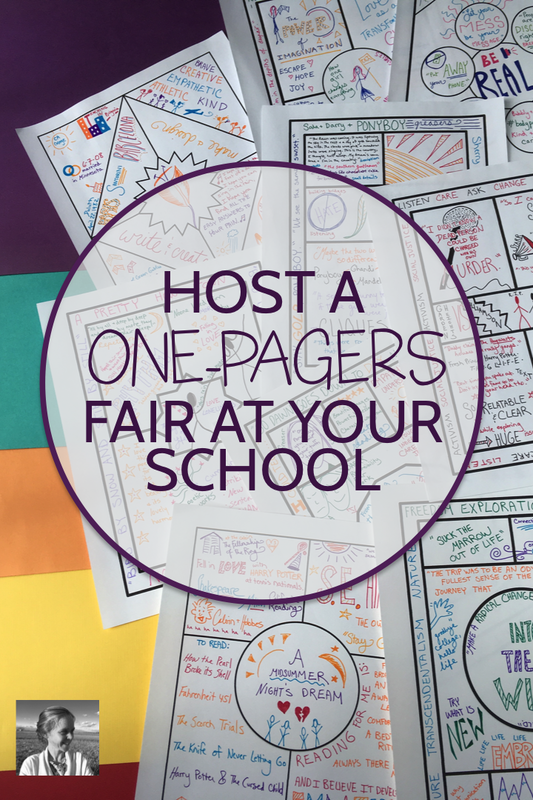 You could make fair entrance mandatory for the students who do the one-pagers project in class, or just let the kids who get really into it enter. However you choose to format your one-pager fair, there will be a few key steps that will help you achieve success. Figure out your location and date and get those locked in. Then, you'll want to advertise the fair somehow throughout the school and community. Consider using the easy poster-making tool over at Canva to make a poster like the ones below (made in Canva), and add in the details of location, date, and time. Feel free to download the top poster and drop it into a Powerpoint slide, adding your logistics across the bottom, if that feels easier. You'll want to enlist a panel of judges to award prizes for the fair. These could be members of your English department, but they could also be a panel of local authors, journalists, graphic designers, or other related professionals. I suggest you design a SIMPLE rubric for the judges, so they don't have to spend an hour with each entry. Consider a few categories like these, with numbers up to five or ten for each. You'll want to decide what you'll be awarding prizes for. Will you just have Best Overall and second and third prizes? Or will you award prizes at each grade level? In different categories of one-pagers (podcast, short story, etc.)? For the different rubric categories, like Best Graphic Design, Best Textual Interpretation, etc.? Then you'll want to create certificates for those prizes. Again, Canva is a very easy way to do this for free. Perhaps you can find some local sponsors interested in putting some money or other prizes up to go with your certificates. You might even be able to fund your special event through Donors Choose, and get money there to provide prizes. Once you've nailed down these details, you're ready for an amazing event. See if you can recruit some parent volunteers to bring refreshments, and add a little background music on the big day if at all possible. I hope you're inspired to start recruiting team members in your department to host your very own one-pagers fair. I can't WAIT to see pictures! Please tag me on Instagram @nowsparkcreativity or post in our Facebook group, Creative High School English, so I can applaud your awesomeness. I have been looking everywhere for this topic. good schools in delhi this blog gives my a chance to work on my essay as it as thorough explanation and steady writing. thank you so much. I have been looking everywhere for this topic. dldav pitampura student loginthis blog gives my a chance to work on my essay as it as thorough explanation and steady writing. thank you so much.